With this electric heat traveling mug they can make your coffee/ tea always warm. Simply plug into the cigarette lighter in your car and you can also enjoy in the cold season warm your coffee. Portable for heating water, coffee, milk, eggs, tea, etc. With safety lid, the water will not overflow no matter drinking or placing. Suitable for drivers, business man or any other kinds of people who need long time driving trip. Please allow slightly error due to manual measurement, thank you! 1. Before using the kettle, please do the dry cleaning (washable inside of the cup). The electrical components do not enter the water or wet to prevent short circuit damage. 2. Can only use a specified power supply, that is to distinguish 12V and 24V from mixed use. 3. Do not dry burn the water, the heat pipe should be completely immersed in the water, the minimum water level should not be less than 1/3 of the internal bladder. 4. The water level should not be higher than the parts of the stainless steel body so as not to overfill. 5. After the burning, pull out the power, and then press the water outlet switch. 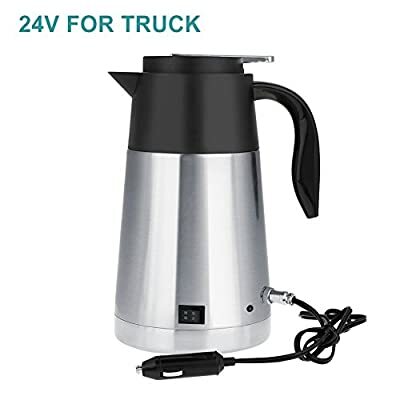 • NONTOXIC MATERIAL: Car electric kettle made from 304 stainless steel and food grade plastic material, safe to drink the boiled water. • GOOD SEALING PERFORMANCE: This heating cup has good sealing performance to keep water warm with sealed kettle cover,and ensures that the drink does not spill over. • VACUUM INSULATION TECHNOLOGY: Heating water mug has kettle inner and outer using vacuum insulation technology,good insulation effect to prevent burns. • CONVENIENT TO USE: Standard 12v/24v car power plug,built-in fuse,external power indicator,safe design,ease of use. • WIDELY USED: Car electric kettle suitable for boil water, brew coffee,milk powder,boiled eggs and so on.